Bridal bouquets for a Christmas wedding can reflect the holiday season. From a classic seasonal bouquet of red roses, carnations and greenery to a cascading bouquet of white roses, ivy, holly and red berries, Christmas brides have many choices for that finishing touch. Rich red roses are one of the most popular flowers for Christmas weddings, but adding unique greenery to your bouquet will match seasonal colors in an unexpected way. Unripe grains, holly, ivy, and grasses are all great choices to help build a red and green bouquet. 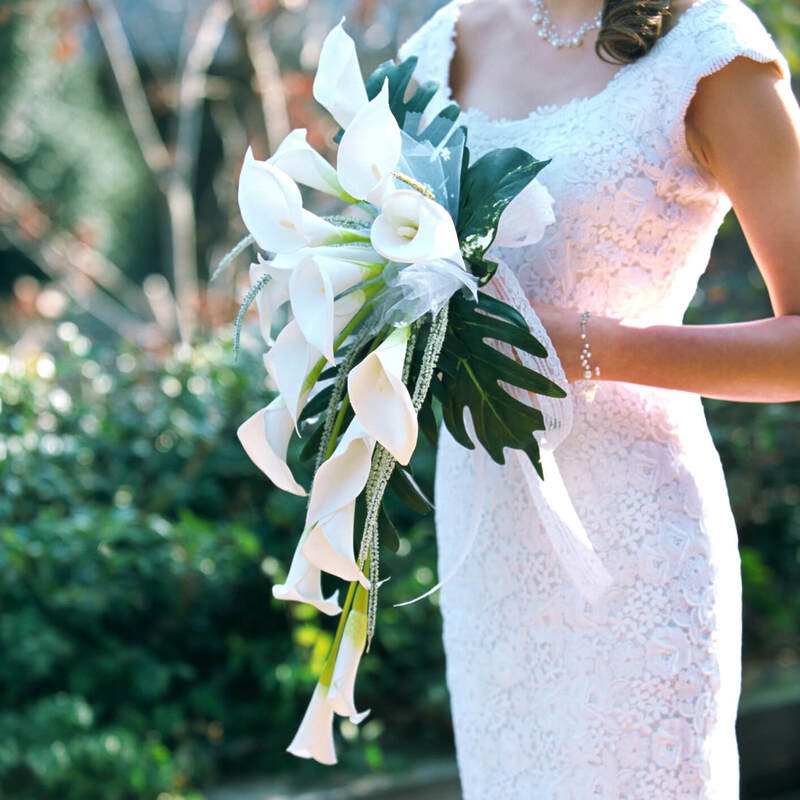 All white wedding bouquets are popular for winter wonderland Christmas themes. White roses and shimmering ribbon can make a classically elegant bridal bouquet, and adding plenty of baby's breath will make it look delicate and snowy to match the season. Instead of carrying a traditional bouquet, Christmas brides may opt for more holiday themed arrangements such as a cascade swag anchored not with flowers, but with a holiday ribbon. This is a unique and lovely option and if it is made with artificial greenery and accents, the couple may be able to use it to decorate a door in their home for many holidays thereafter. Poinsettias are a classic holiday flower perfect for Christmas wedding bridal bouquets. Instead of predictable red poinsettias, however, choose elegant white blooms or bi-colored flowers for a more unique arrangement. Poinsettias are even available in unusual shades such as pink or peach, and artificial poinsettias can be your something blue. A simple white wedding bouquet accented with soft pine greenery has a definite holiday touch without going overboard. This small bouquet can even be carried by bridesmaids in red dresses to complete the holiday palette. A mistletoe bouquet is a romantic and whimsical holiday option. Tied with a red ribbon, it is also a lovely accent that can be hung above entrance to the reception in preparation for the couple's arrival or above the head table for a whole evening's worth of holiday wedding kisses. Holly is a bold holiday plant that can work well in Christmas wedding bridal bouquets. Different varieties of holly come in different shades of green or may be edged with white, and don't forget to include some berries in your bouquet for a burst of holiday red. Red and white tulips are an unusual Christmas flower that uses the bold colors of the season in a unique way. Because tulips are spring flowers, however, they can be much more expensive for winter brides to choose. Rich, deep browns reminiscent of steaming hot cocoa are a popular color for holiday weddings, and adding brown touches to a bouquet can make it memorable and interesting. Berries and bold red flowers also add a burst of color and seasonal cheer to the arrangement. Ribbon tied bouquets are popular, and using red and green plaid ribbons to accent Christmas bouquets is a whimsical seasonal touch. Gold, silver, and other metallic ribbons are also popular. A daring bride may opt for a pine cone bouquet accented with berries and evergreens. This is also a great option for brides who are allergic to flowers, and using cinnamon scented pine cones is a fun way to add even more flair to the wedding flowers. Crystal or glass flowers are a luxurious and unusual option perfect for Christmas brides because they look delicate and icy but still have the romance of flowers. Many brides also choose crystal sprays in lieu of traditional bouquets, or they may have crystals or other icy accents added to their flowers. Need more ideas for a Christmas wedding? Check out this slideshow of Christmas Wedding Dresses and these Pictures of Christmas Wedding Ideas for more ways to bring the holiday spirit to your special day.